With Sean Connery having packed his bags and (temporarily) moved on to pastures new, the caretakers of the James Bond franchise were faced with a dilemma - Connery had become so firmly entrenched in the public psyche as the big screen Bond that replacing him was going to be a daunting task. By October 1967, EON Productions had resigned itself to the fact that Connery simply wasn't coming back to the fold and had begun the process of tracking down their new Bond. By April of the following year, Broccoli and Saltzman had drawn up a list of some 100 actors they wanted to screen test and set about seeing as many of them as possible. Future Bond Timothy Dalton was among their number, as were Hans De Vries, Robert Campbell and John Richardson, and a year previously, Saltzman had mentioned his desire to see Roger Moore take over the mantle, though his work on TV's The Saint more or less ruled that out at the time. The part eventually went to an unknown Australian, 28 year old model George Lazenby who had blagged his way into an interview with Saltzman and, through judicious bending of the truth, had persuaded the producer that he was the man for the job. 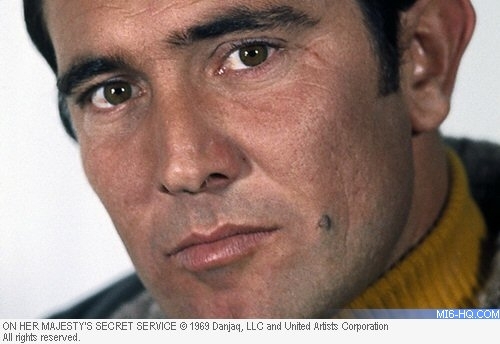 Above: George Lazenby as James Bond. So keen for the part was Lazenby that he even went to Broccoli's barbers in Mayfair to have his hair styled after Connery's. During his audition, which required him to attack former wrestler Yuri Borienko, Lazenby actually broke his opponent's nose, impressing director Peter Hunt with his physical strength and presence. Hunt had been a long-standing player in the Bond series, initially as an editor and, on You Only Live Twice (1967), as a second unit director. Saltzman and Broccoli had long promised Hunt the chance to direct the main unit of a Bond film and, with a new front man stepping in, he was given the chance to continue a clean sweep of changes. Hunt was re-united with another Bond 'old boy', Richard Maibaum, back in the fold after missing out on You Only Live Twice and here writing his fifth Bond script. Maibaum had originally planned to introduce Lazenby with a plastic surgery sub-plot. 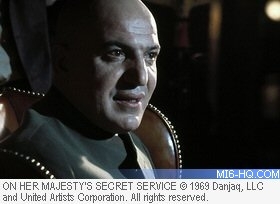 In his first draft, Bond was to undergo the surgery at the very beginning of the film, his appearance being changed because his face was now too well known to his enemies. Thankfully, the idea was quickly dropped. Maibaum was assisted by Simon Raven, the author of the novel Doctors Wear Scarlet, filmed by Robert Hartford-Davis as Incense For the Damned (1969), who was commissioned to work over some of Maibaum's dialogue. Hunt too would have his say in the script, adding new material throughout the film's protracted shoot, and expert advice was sough from the College of Arms in London to lend some realism to the scenes where Bond has to pass himself off as an expert in genealogy. Above: The leading lady of "On Her Majesty's Secret Service" - Diana Rigg as Tracy. Lazenby got the first chance in the series to show a different side to Bond's persona when, in the film's closing stages, he falls in love with and marries the doomed Contessa Teresa de Vincenzo. To play this demanding role, Broccoli had originally wanted Brigitte Bardot but that avenue was cut off when she signed up for Edward Dmytryk's Shalako with, ironically, Sean Connery. In her place, EON pursued Catherine Deneuve but she was adamant that she simply wouldn't even consider the part. Eventually, the role went to the second ex-Avenger (after Goldfinger's Honor Blackman) to appear in the series, Diana Rigg, who had only recently given up her iconic role as the incomparable Emma Peel. Rigg turned out to be the perfect choice, bringing an emotional depth to the role that may well have been missing from anyone else. Her vast experience in film, theatre and television, would help underpin the film and deflect the acting burden away from the inexperienced Lazenby. 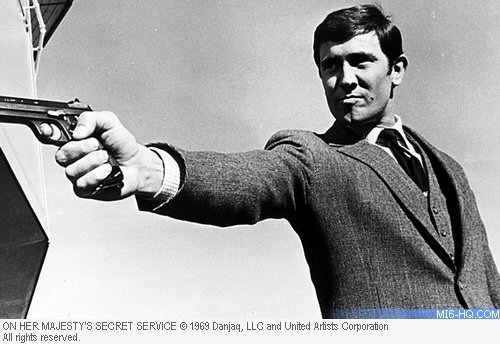 Although Lazenby received much support from Broccoli and Saltzman, he had a less easy ride from the board of United Artists who were none too keen to see him take over the mantle of Bond. On 7 July 1968, test footage of Lazenby and Rigg had been sent to United Artists in New York - and the were less than impressed by what they saw. On 23 September 1968, UA's head man David Picker even flew into London, desperate to tempt Connery back into the fold. But Connery was adamant that he wasn't coming back - EON and UA had made him a star and Connery was now a major player, capable of picking only the roles that interested him. And at this moment, Bond simply didn't interest him at all. It was only reluctantly that UA accepted EON's recommendation that Lazenby be given the part. 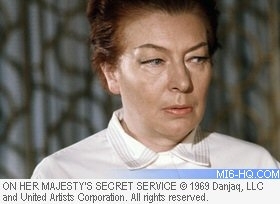 EON now had to face the press and break the news that this total unknown was going to take over as Bond. After a course of elocution and acting lessons, Lazenby was packed off to the Riviera for a short break while EON publicists prepared for the great unveiling, which was announced to the public by the press on 3 October. EON then moved to snap up the advertising material that Lazenby had previously modeled for, hoping to suppress it so as not to distract from their new Bond's image. Lazenby was formally introduced to the world at a press conference on Monday 7 October at the Dorchester Hotel. A second press junket was staged at the Hilton's Roof Restaurant on the 13th of the month where Lazenby posed with his two co-stars, Rigg and American actor Telly Savalas who was to replace Donald Pleasance as Blofeld. 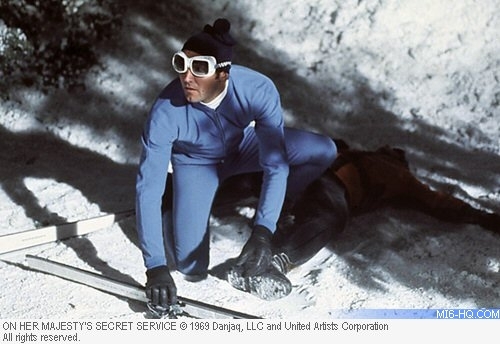 Eight days after the Hilton press conference, on Monday 21 October 1968, the crew of On Her Majesty's Secret Service assembled in Switzerland to begin principal photography. OHMSS was a considerably more frugal production than the lavish You Only Live Twice and, sadly, one of the casualties of the cost-cutting was Ken Adam, whose magnificent sets were to be forsaken this time round. Instead, the film's main location, Blofeld's mountain top lair, was represented by a massive circular restaurant, an architectural folly perched almost 10,000 feet above sea level on one of the peaks of the Swiss Schiltorn mountain range. EON had to pay out for a complete interior refit to get the look that production designer Syd Cain was after when the Swiss authorities refused planning permission for his original plans and a fully functioning helicopter pad also had to be built at EON's expense. This still proved cheaper than paying for another set of Adam extravagances however. As shooting got under way, it soon became clear that this wasn't going to be an easy ride for anyone. Lazenby, still a little phased by the amount of attention he was getting from the world's press, found it particularly stressful and he later accused Hunt of failing to give him the guidance he felt he needed. There was also reports of some friction between Lazenby and the rest of the cast and by January 1969, some three months into shooting, the actor still hadn't actually signed his contract with EON. United Artists had wanted him to sign up for seven films, but all Lazenby would offer them was a letter of intent while he had a lawyer friend pick through the hefty contract he had been presented with. Working in the rarefied air of Murren, a tiny Swiss village which suddenly found itself invaded by Bond personnel, made strenuous work uncomfortable and an accident with a cable car stunt, which left Lazenby's double George Leech with a dislocated arm just added to the tension. Then, to add to the crew's miseries, an unexpectedly mild winter set in and the snow disappeared, forcing the production to close down altogether for a while. Hunt and the main unit decamped to Pinewood and a second unit team was dispatched back to Switzerland in January to complete pick-up shots. The most pressing problem for EON throughout January 1969 was Lazenby, and more specifically the reports that had started to appear in newspapers around the world about his behaviour on set. Rumours began to spread of an increasingly bitter dispute between Lazenby and Rigg, though many of them were exaggerations and distortions. The press specifically picked up on one incident in which Rigg, about to film the romantic scene wherein Bond proposes to Tracy, shouted to Lazenby across the set that she's be having garlic for lunch. Inevitably, this playful remark was misrepresented as a genuine falling out between the two stars. 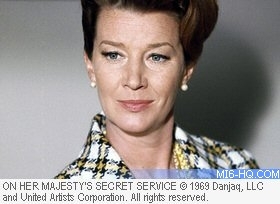 According to Lois Maxwell, however, the truth was rather different. Lazenby was rumoured to be "emotionally involved" with Rigg but was an uncompromising womaniser which made a tense working environment even less palatable. The press, eager for gossip, picked up on unsubstantiated rumours and ran with them and the situation was muddied further when Lazenby and Rigg, apparently deliberately, gave different accounts of their relationship to different reporters. Above: Bond's allies Miss Moneypenny (Lois Maxwell) and Marc Ange Draco (Gabriele Ferzetti). By the time February rolled around, Hunt was falling behind in his schedule and asked John Glen, the film's editor, to come to the set and act as his second unit director. Glen later suggested that the film was falling behind because of all of the action scenes necessary to distract audiences away from the fact that Lazenby wasn't much of an actor. More problems were encountered when Hunt came to shoot the bob sleigh chase. Originally, it was set to be shot at the famous Cresta Run in St Moritz, but the location was judged to be unsuitable due to its very public nature - everyone knew where the run was and there was open access to the site. EON therefore brought in bob sleigh champion Franz Capose to build a special two mile run near the main location in Murren, using an existing run that had been closed down in 1937 for being too dangerous. Clearly this was adding to the expense and with the main unit having problems of their own, Glen was assigned the unenviable task of getting the bob sleigh sequence shot as quickly as possible. Glen had never met Broccoli until the day the producer arrived on the set and insisted that he be allowed to try out the newly built run for himself. After importing huge amounts of ice from Berne to replace that which was melting at Murren, Glen was ready to shoot the sequence, his first of many for EON. With multiple camera crews in place (including an aerial team headed by John Jordan, back with EON after his accident on You Only Live Twice), the bob sleighs set off with bob sleigh champion Heinz Lau and Olympic skier Robert Zimmerman acting as doubles for Lazenby and Savalas respectively. But the mild weather had made the ice unpredictable and as Lau careered around a particularly tight bend, his sleigh left the run, throwing Lau into the path of Zimerman's sleigh. Zimmerman himself tried to avoid hitting Lau, resulting in a collision that left him with facial injuries. The accident was captured on film by pursuing cameraman Willy Bogner Jr, himself a former Olympic downhill racer, and the footage actually appears in the finished film. While all this was going on, Anthony Squires was at nearby Lauterbrunnen staging the stock car sequence. The second unit then set up at Grindelwald where they staged the sequence where Bond meets Tracy while ice skating - Lazenby had been told by the production's insurance company that he was not to take part in the skating sequence though the actor was keen to take part in as many of the stunts as possible. Next on the agenda was the spectacular ski sequence as Bond and Tracy make good their escape from a barn, hotly pursued by Blofeld's agents on skis. The sequence was filmed by Willy Bogner and orchestrated by Glen over five gruelling nights near the village of Winteregg. Hunt now had to stage one of the most spectacular and dangerous of all of the film's many action sequences, the avalanche that engulfs Bond and Tracy. As long ago as summer 1968, Hunt had had the Swiss army plant explosive charges in the snow and had patiently waited for the winter snows to completely cover them ready for the stunt in Spring 1969. But things were slightly awry - while the second unit was filming the bob sleigh sequence, the avalanche happened naturally, ruining all the preparation. A desperate Glen tried to create a convincing avalanche using a snowplough and even tried setting off the charges anyway to see what would happen. The avalanche seen in the finished film is made up mostly of stock footage combined with a smaller avalanche that Glen was able to rig up in May. While Glen and Hunt grappled with nature in Switzerland, Saltzman and Broccoli had more prosaic but no less serious problems to deal with. Lazenby was still dragging his heels and refusing to sign his contract. Saltzman became so desperate to ensure Lazenby's commitment to the series that he started offering him financial incentives while United Artists offered to give Lazenby any film he wanted if he signed on the dotted line. But by now, Lazenby was taking advice from Ronan O'Reilly, a some time film producer and head of Radio Caroline who was urging the actor not to sign his contract. In O'Reilly's view, the Bond films were a spent force, unwanted by the new late-60s generation. Lazenby was finding all this conflicting advice confusing and he turned to Peter Hunt for his opinion, putting the director in a rather awkward position. United Artists were growing impatient and were leaning on Saltzman and Broccoli. They in turn piled the pressure on Lazenby and, inevitably, he jumped the wrong way. Lazenby opted to listen to O'Reilly and his other advisors and announced to the producers that OHMSS would be his solo outing as James Bond. 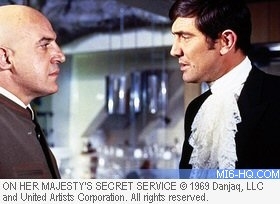 Before Lazenby could hang up his tuxedo for good, he still had a lot of work to do on OHMSS. Pick ups and inserts were finished in Switzerland before the production returned, temporarily, to their base at Pinewood. During the second week of April, the crew found themselves in Marlow, ten miles from the studio, where the house Thames Lawn was to stand in for M's home. The globetrotting resumed at the end of the month when the production headed out to Estoril in northern Portugal where Bond's marriage to Tracy was filmed at the Palacio Hotel. Just down the coast at Guincho Beach, Lazenby shot his pre-credit fight with the goons trying to abduct Tracy. Also shot in Portugal was Draco's birthday party which was staged at the De Vinho estate in Zambujlal. Portugal was also the location for the most dramatic moment in any Bond film, the shattering climax when Tracy is murdered by Irma Bunt. Lazenby was allegedly kept awake all night and cajoled into giving perhaps his finest performance - so involved did he become that the first take, in which Lazenby actually burst into tears, was abandoned in favour of the more restrained and effective version seen in the finished film. Finally, on 23 June 1969, the lengthy and traumatic shoot was over, almost two months past the scheduled end date. But further problems were awaiting the production. John Glen set to editing the footage that he and Hunt had shot and it soon became clear that the film was not going to fit into the usual under two hours running time. Glen's first cut came in at 170 minutes and it was clear that a lot of footage had to be sacrificed to make the film more manageable. Lazenby's Bond met his public for the first and only time as Bond when the film was premiered at the Leicester Square Odeon on Thursday 18 December 1969. Lazenby was in attendance along with Rigg and disappointed many turning up with a decidedly un-Bond-like shoulder length hair and a heavy beard. Though the film failed to match the box office stamina of the previous films, it was certainly not the disaster that many critics have sought to paint it as in the intervening years. It was the most popular film in the UK throughout 1970, though globally it's take was just over half that of You Only Live Twice, mainly due to a relatively poor showing the States. 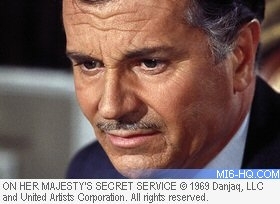 It was becoming clear to EON that, as Bond entered a new decade, something of an overhaul was called for.